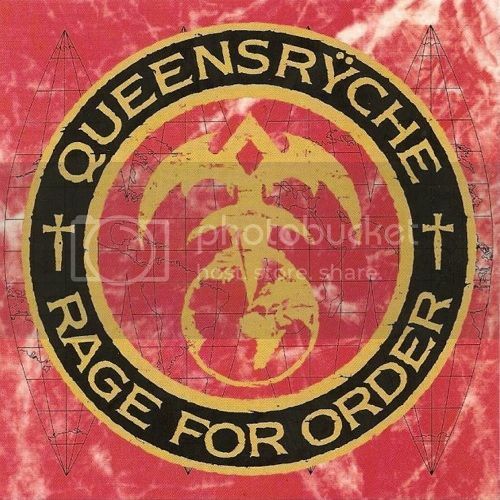 What Is The Best Queensrÿche Album of All Time? How I got into Queensrÿche is interesting unto itself. It was by chance really. I had already scored my tickets to see KISS on their Animalize Tour and opening uo for them was Queensrÿche. I didn't have a f u c k i n g clue who they were, but the name sounded really cool. I had gotten the ticktes about 4 months before they were to arrive in town and in that time, I never even gave it a thought to find out more about this band. It was literally 5 minutes before I was heading down to the Sports Arena to see KISS in concert. As I was about to turn off MTV, on comes Take Hold Of The Flame. I immediately said to myself "that's them"? I wasn't saying it based on their look but on the fact that I had been rocking out to this mystery song on the radio whenever it came on. But they never said the band's name, so I didn't have a clue they were one and the same. So, it was kinda cool that I was suddenly going to see them in concert and get to hear the song live. It was awesome. They tore it up and ended up putting on one of the best shows I've ever seen for an opening band. So, what about the album? I ended up picking up The Warning shortly after just for the song. 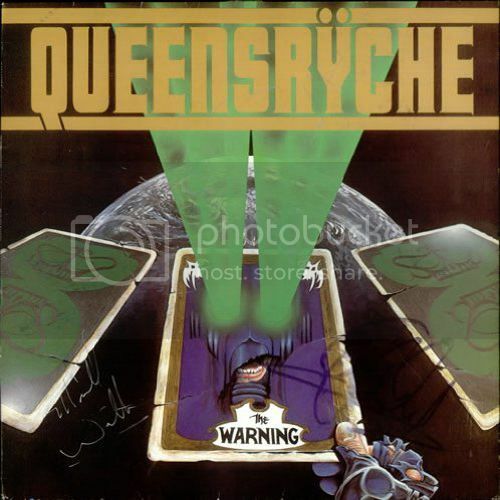 Although I enjoy The Warning, it was never something I would listen to over and over and I think the reason why is because Queensrÿche was a very progressive metal band at the time. I thought both Geoff Tate and the band itself was amazing. I had never even heard anyone that could hit notes that high before and that's what a lot of The Warning is. So it was jarring to hear everything an octave higher and layered at the time. The album is still great, but far from their best. That would present itself over the next few years. But the blueprint of what's to come can be found here. This is probably the first time I've listened to all of The Warning since maybe the late 80's, early 90's and a couple of songs just don't hold up as well as I remember it. Fave Songs: Warning, NM 156, Before the Storm and Take Hold Of The Flame, which gets the MVP award. To say that I'm stunned doesn't even begin to describe how I'm feeling about this. This is definitely career suicide. I can't believe Michael Wilton would even go down this road. What the f u c k ! Rockin' The Warning as I get back into my Queensrÿche marathon. good job and yeah that sounded pretty bad....funny because a lot of people online (youtube specifically) are talking major **** about Tate. they have a lot of clips from the show...it's pretty interesting to see. You referring to the show in Rio or Rocklahoma where he called them a s h i t t y audience? these are from the show where the fight took place right before they went on stage...and the drummer basically said to Tate..."we fired your family and you are NEXT"
Geoff attacked him and then threw the guitarist to the ground. Watch, they are going to get Ripper for a couple of Tours and decide to patch things up with Tate for the mega reunion tour. To get back on point, the only reason I can think of why the other members would want a 3rd party vendor taking over merchandising is that they knew these people and that they would be skimming the take and splitting the profits with everyone not named Tate. That's the only logical reason to do that. It makes no sense to give your money away for the sake of doing it. Roads To Madness perfectly describes this c l u s t e r f u c k that is going down. There is no reason on Earth that anyone as young as these cats were when Rage For Order came out that it should be this good. Now when I say 'good', I mean so far advanced that it made everyoen else look ridiculous in the stuff they were putting out. The term "ahead of its time" gets thrown around a lot lately which loses it's meaning. 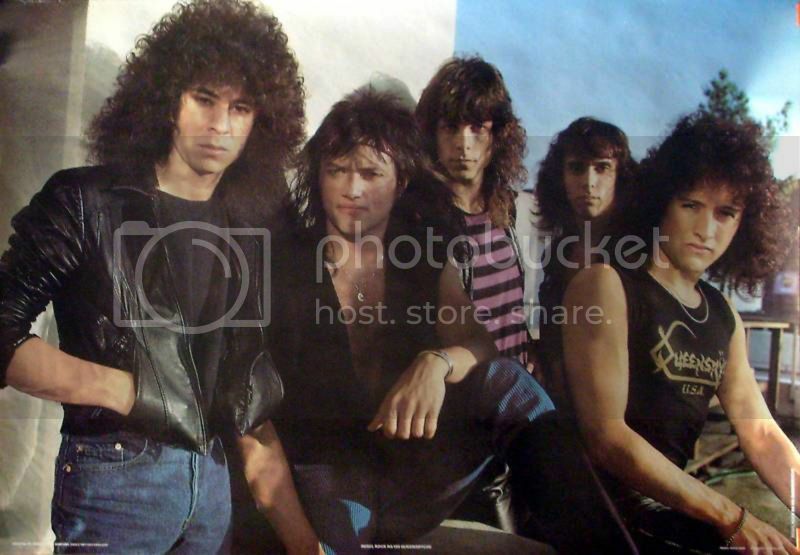 In the case of Queensrÿche, they were a million miles ahead of everyone in songwriting, musicianship, vocal range and stage shows. It's been years since I have listened to this album front to back and I'm just blown away by the fact that something so advanced came out over 25 years ago. I was talking to friend of mine yesterday about Rage and he hit the nail on the head about how it blows away anything that is out now. He said "its aged like fine wine". I agree with what he was getting across, but I disagree about it aging like fine wine. To me Order was always a case of Chateau Lafite right out of the box. If there is one negative I do have with this era of the band is that they suddenly went with the Glam look which was totally unnecessary. I get that they wanted a larger fan base and becoming part of the LA Scene at the time seemed to be the most logical way to get there. But unlike the bulk of bands they were lumped with, these guys have an album that stands the test of time. What's scary is that their best is yet to come. from the interviews I've watched the last few days they were still teenagers when the band formed so like you said...they were probably all 20-22 years old when they did this which is really amazing...they had such an original vision! Why the f u c k isn't London the official song for the 2012 Summer Olympics?